and every year I fail...until NOW! and it is looking G-O-R-G-E-O-U-S! I had so many ideas running through my head (as usual). but then I started creating and this little ensemble is what fell into place. decorating the present she picked out for her brother. 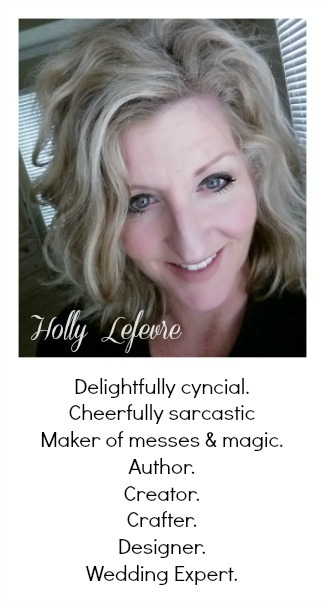 The one thing that did remain constant is a basic "background" for my look. I have used Kraft Paper to wrap presents since the 80's! So I figured this was the perfect starting point. I also picked up some really inexpensive red and white dot paper while I was at Walmart - just to add a little color! 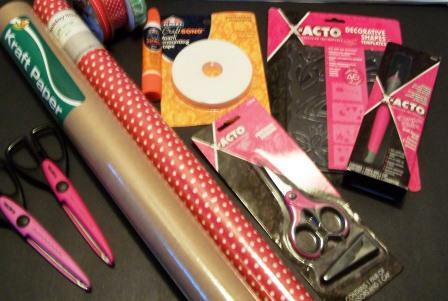 Of course I picked up some of my favorite Elmer's and X-ACTO supplies while I was there...plus a few more things (of course!). 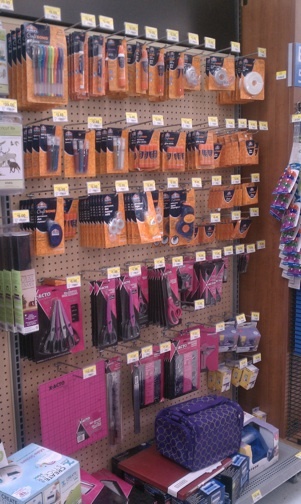 Have you checked out the selection of Elmer's and X-ACTO products at your local Walmart? Walmart has an amazing and complete selection of these products...I seem to discover a new product each time I shop! 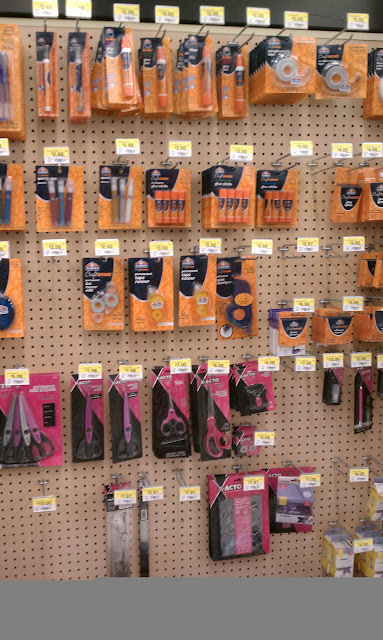 And lots of people must be shopping - this wall was well shopped! 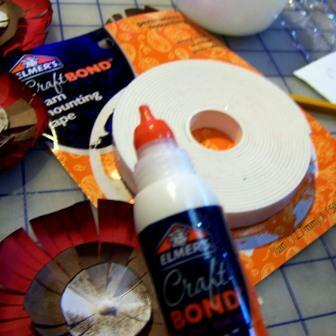 Did you know Elmer's is having a "Win the Wall" contest too? 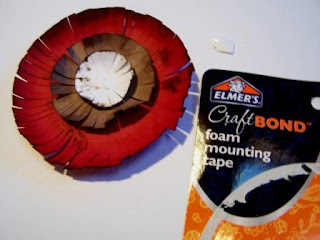 Click on their button down on the bottom of my post to enter to win the wall of Elmer's! Take a look at that wall...wouldn't that be awesome! 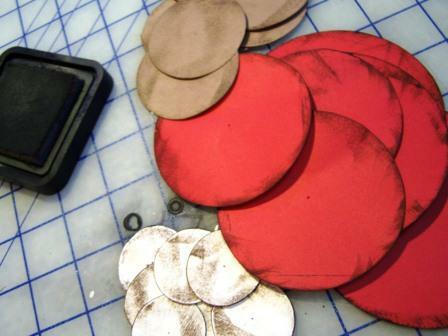 Cardstock (or heavyweight paper): red, green, and white. 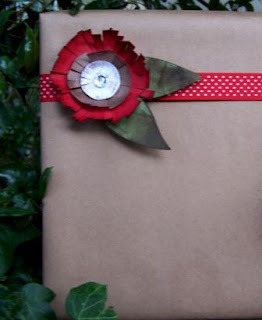 Use the Kraft paper for the 3rd color. 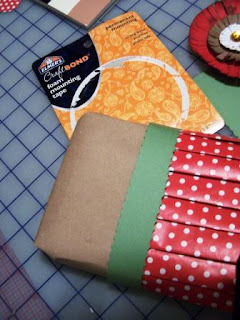 Wrap it: I used a combination of the Kraft Paper and the dot wrapping paper to wrap the gifts. 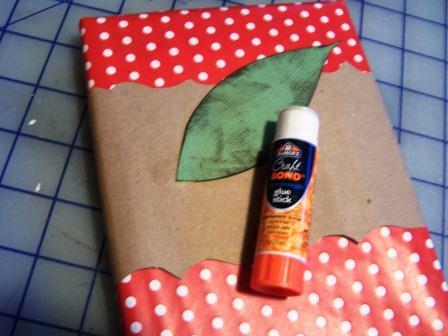 They all look pretty now because I also used Elmer's Permanent Scrapbooking Tape - it is double-sided, so it is perfect for wrapping pretty presents! 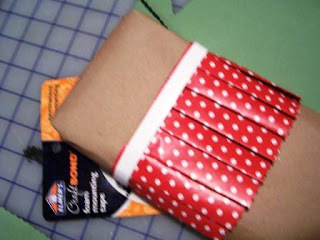 See no ugly tape lines! 3. 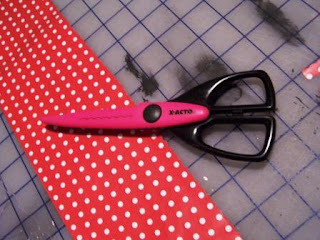 Use the Precision Tip Scissors to make fringe. 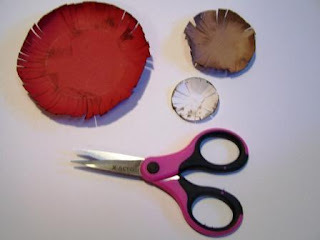 If necessary use the next smallest circle and center with the larger circle; trace lightly around the smaller circle with pencil - this is a guide for how deep to cut in to make fringe. 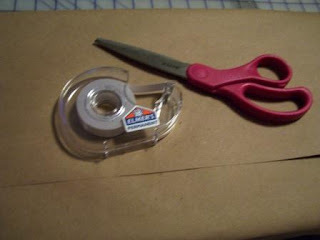 I did this for the first few and then just was able to "eyeball" how far I could cut for the rest (it is not science!). 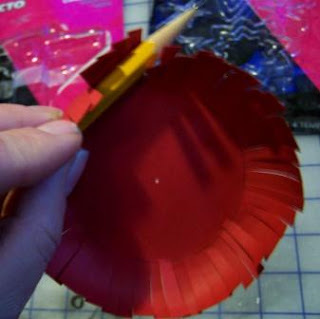 With the Precision Tip Scissors make small cuts into the center of the circle, using the pencil line as a guide to not cut too far. 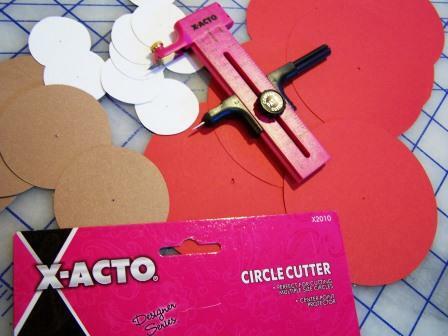 Make cuts all around the circles, each one, in each color. 4. 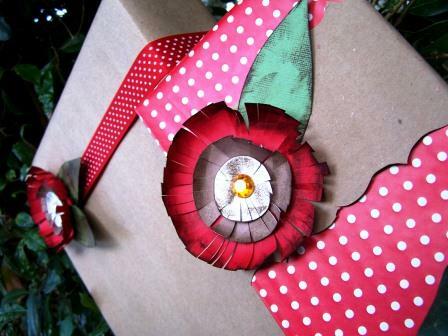 Give the flower some dimension by wrapping the fringe around a pencil to curl it up. 5. 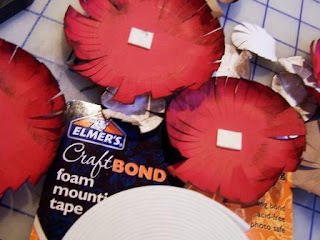 To create my flowers, I used the Foam Mounting Tape - I felt like that little bit of foam gave a nice dimension to the flowers and brought them to life. Cut: 5 1/4" and 5 1/2" sections of the Foam Mounting Tape. 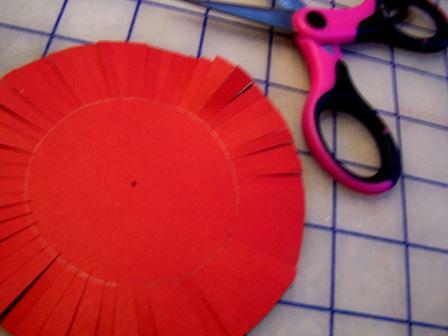 Place the 1/2" piece in the center of the red circle; remove backing. Place the Kraft paper circle on top of the Foam Mounting Tape, centered. 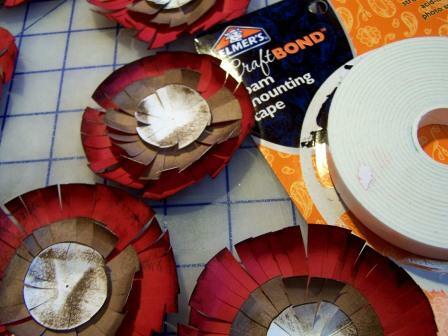 Apply the 1/4" pieces of Foam Mounting Tape to the top center of the Kraft paper circle, remove backing. Apply the white circle to the Foam Mounting Tape. Press down to adhere. 6. 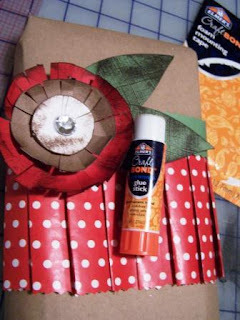 Use the Dual Tip Flexible Glue Pen to apply a small amount of glue to the center of each flower (on the white circle); add rhinestone/gems. Let dry. 7. (Optional) Finish flowers by apply glue with a CraftBond Glue Stick to the back side of the flower; affix on leaf; apply more glue; affix other leaf. 1L. 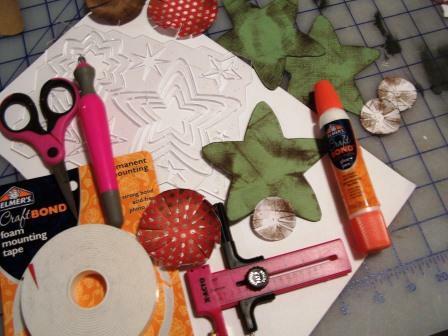 Cut leaves from green cardstock using the Decorative Shapes Template and a Craft Swivel Knife. 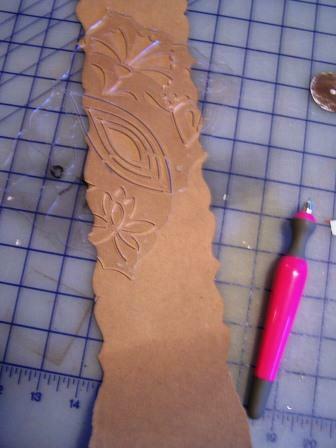 I have never used the swivel knife before- it took a minute to get used to the feel/flow, but after that it was great! 2L. 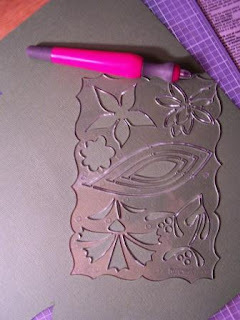 Ink the edges of the leaves. 1B. For the larger Kraft Paper band, measure off a 4" wide strip on the Kraft paper. 2B. Align the desired edge of the Decorative Shapes Template to the line and using the Craft Swivel Knife, cut and edge. 3B. When necessary, re-position template to continue with the length of the band. 4B. Repeat on the opposite side. 5B. For the smaller band, measure off a 1 1/4" strip of paper. 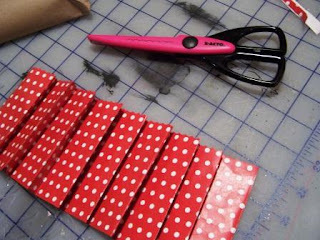 Using the Decorative Edge Scissors (in your choice of edging), cut each side of the strip to create a smaller band. 2P. 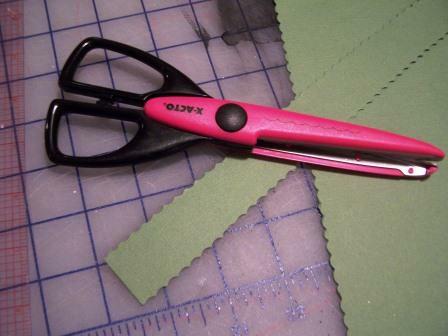 Cut one side with scissors fold top half over 1"
4P. 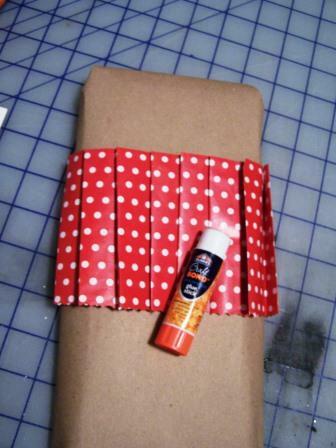 Beginning at one side, make 1/2" pleats all across the length of the paper. 5P. 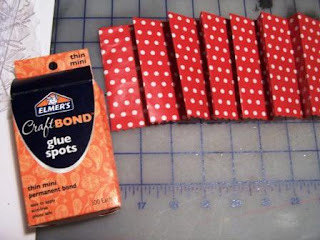 Use Glue Spots to hold pleats in place, by placing one Glue Spot in the fold of each pleat. 6P. You may need to make multiple length of pleats to get the desired length. 1S. 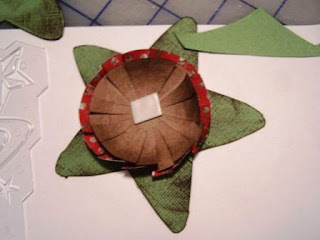 Cut star shape out of green cardstock using the Decorative Shapes Template and Craft Swivel Knife; Ink the edges of the star. 4S. 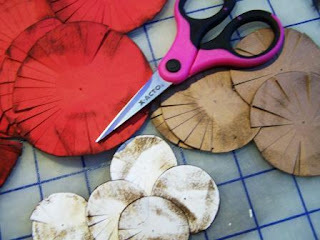 Fringe edges of the circle using the Precision Tip Scissors, See Step 4. 5S. 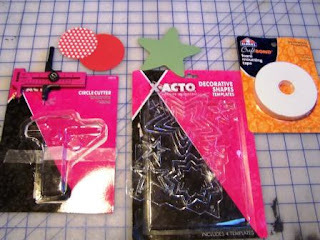 Construct stars using the Foam Mounting Tape and the same method as Step 5. 6S. Apply rhinestone, see Step 6. 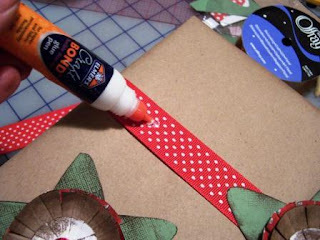 STARS: Place a length of ribbon vertically on the package and affix with Glue Spots or Glue Stick. Use the Elmer's CraftBond Dual Tip Flexible Pen and apply glue to three positions on the ribbon. 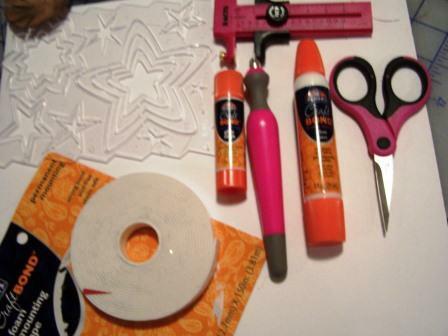 Set the stars on the glue and let dry. 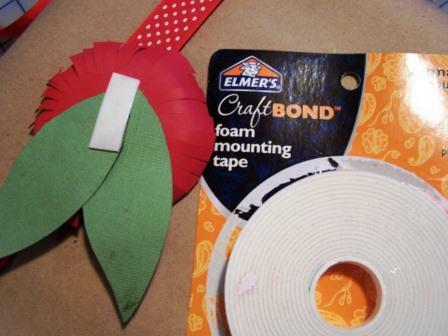 all ready to go under the Christmas tree. until they read this post! Are you wrapped and ready to go????? Disclosure: This project has been compensated as part of a social shopper insights study for #ElmersHoliday #gluenglitter #collectivebias #CBias. All projects and all opinions are my own. Your packages made me smile. I love all the layers and colors and polkadots...but my favorite was the ruffle of polkadots!!! You did awesome!!! Love these, they look great and all with paper!! Merry Christmas! Your packaging looks great, Holly! I tell myself I'll dress up my packages every year, too, but I never do since I'm usually wrapping everything at the last minute. I really love the pleating! Oh my gosh, if I got one of those presents, I wouldn't want to open it up! So pretty! Love all of these. I wouldn't want to open them though they're so gorgeous! Those are adorable. 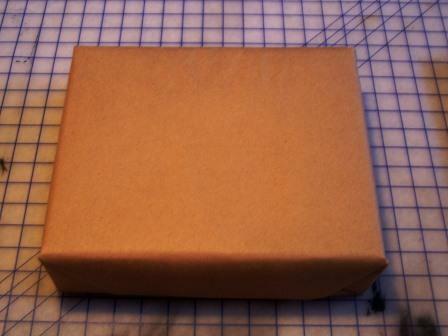 I would love to get that package but wouldn't want to open it! Very fun! 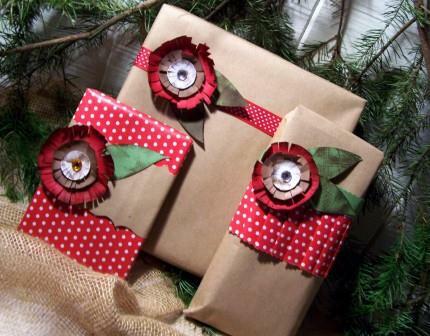 It would be hard to open these on Christmas day! Way too pretty to unwrap. 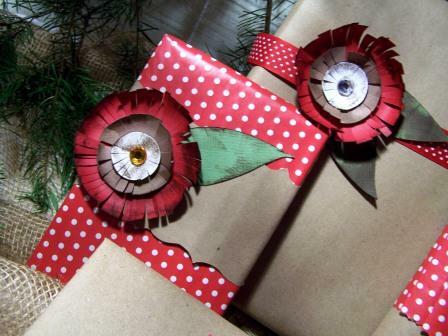 I would love to get a gift that looked like these. 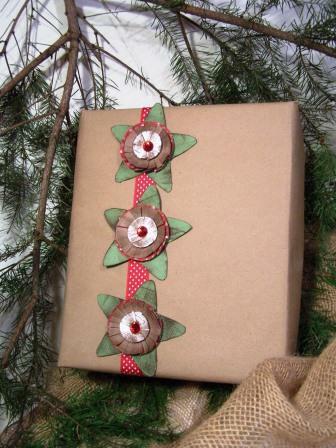 Your gifts look so great...you've inspired me to get more creative with my gift wrapping. 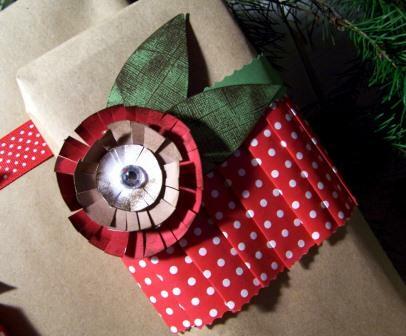 Such cute wrapping I wouldn't want to tear this package open! !